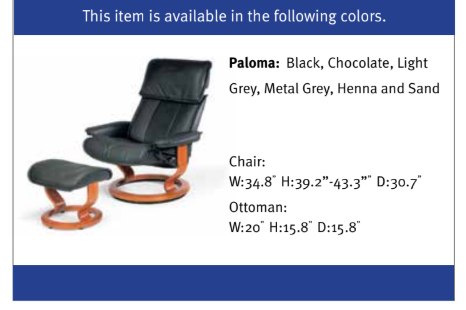 The Stressless Admiral Recliner is on sale in Paloma Special colors, but only for a limited time! Ekornes prides itself in creating furniture that is stunningly beautiful and lasts a life time! The Stressless Admiral Recliner is no exception and Ekornes is so sure of its outstanding quality, that they back it with a 10 Year warranty! To view more information on the Amazing Ten Year Warranty, simply click on the "Warranty Details" tab above. Some of the amazing features of the Admiral Recliner includes its ability to Swivel a full 360 degrees, recline, and the head rest can be adjusted for maximum comfort. Looking for a smaller sized Admiral? Currently, the Admiral Recliner is only available in either a Medium or Large Size. Looking for the Medium Stressless Admiral Recliner and Ottoman? To view the Medium Admiral Recliner, click on the following link: Stressless Admiral Medium Recliner and Ottoman. The Stressless Admiral Recliner is truly a beautifully designed recliner and is available at a reduced cost in Six amazing Paloma Special colors. The Paloma Leather Grade has become the most popular grade to purchase, due to its luxuriously plush touch. The Six Paloma Special colors that the Admiral is available in includes Sand Paloma, Black Paloma, Light Grey Paloma, Silver Grey Paloma, Sparrow Blue Paloma, and Chocolate Paloma. All six of these beautiful Paloma Special leather colors can be viewed by using the pull down menu above, which is titled: "Select Leather or Fabric Type and Color". Once you have completed your order of the amazing Admiral Large Recliner and footstool, you will receive an email confirming the details. Our dedicated Customer Service Team will typically follow up with you by phone within 1 business day to confirm your order and provide you with an ETA. Our Ekornes Specialists will also do a “double check” to make sure you are receiving the lowest, discounted pricing available. Choose PayPal Credit for their flexible payment options and familiarity when purchasing the Stressless Admiral Large Recliner and Ottoman by Ekornes. Finance your purchase , relax with flexible simple payment options and pay the balance off over time. Remove the pressure of shopping and truly relax and unwind. Easy Payments with PayPal Credit lets you get the comfortable Stressless Furniture when you want it, and budget your payments as you go. You can choose the monthly payment amount and the length of time that works best for you. After all, who know you better than you? Pay with peace of mind. PayPal will notify you when each monthly payment is due, so all that’s left to do is sit back, relax, and enjoy your purchase.